I have one vivid memory of Greenwich, that time when I was a little, in a parking lot of some carnival, it was my first bite into a pizza. The flavor was "smoky" and "toasted" and I loved it. Now Greenwich has evolved into it's best phase ever, as a Fast Casual Dining place where friends can pass the time over delicious and affordable food. Yesterday, I was invited by Greenwich to their new concept store near the Heart Center, and this is what I discovered. And these are what I enjoyed. I'm a Greenwich fan myself. We always grab a box whenever we go to the grocery, remember? So tasty and very affordable. 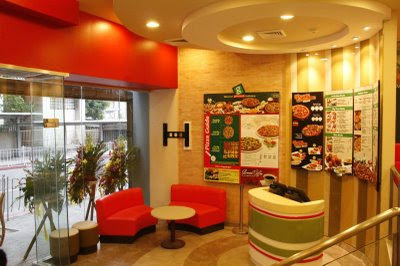 It's my first choice among the pizzerias in Manila.